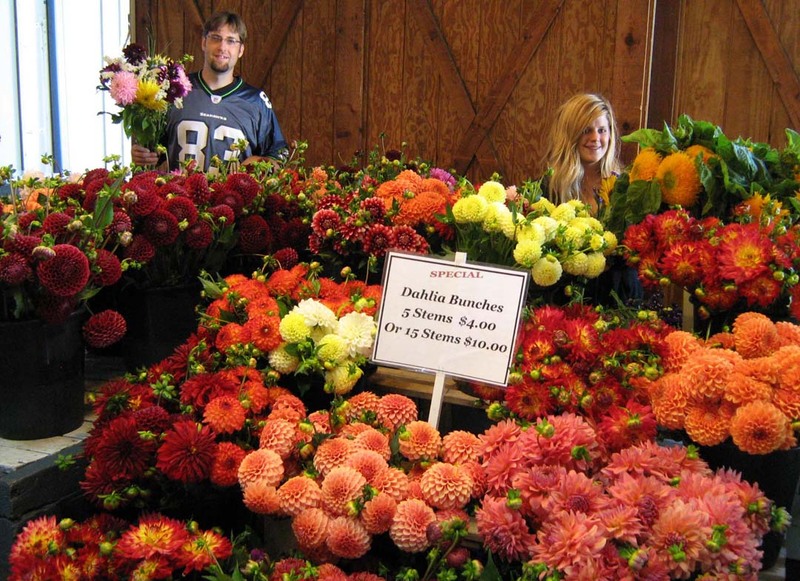 The dahlia bouquets in the Lynch Creek Farm booth at the Olympia Farmers' Market were gorgeous at the end of July, and the sunshine of a warm summer made it possible for Andy and the crew at the Farm to have an abundance of cut dahlias for sale earlier than usual. But something wasn't quite the same. The dahlia bouquets were missing their usual complement of statice, those sprays of crinkly flowers in lavender, pink and white that set off the dahlia colors so nicely. What was up with that? 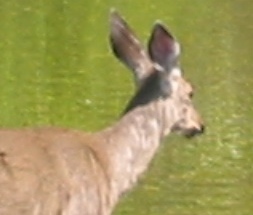 Deer, Andy explained with chagrin. The enterprising little ungulates managed to get into the fenced area where the statice and some of the other flowers that complement the dahlias are grown. "The deer ate the statice," Andy said. "We'll have to do some fence-mending." Fortunately, deer don't like dahlias, and they aren't bothering the fields full of gorgeous dahlias just coming into full flower at Lynch Creek Farm. We hope they don't change their mind about that. 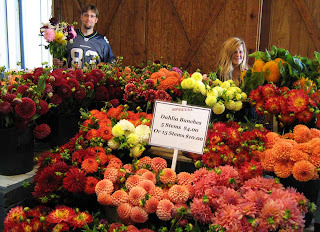 Lynch Creek's at the market with dahlia bouquets! 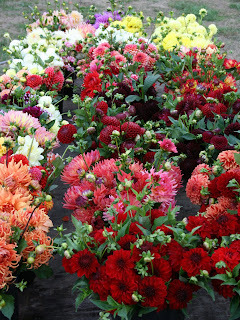 Lynch Creek Farm is back at the Olympia Farmers' Market, this time with a stunning array of cut dahlias from the farm. You'll find dahlias in vibrant colors: lots of luscious deep purples, brilliant yellows and oranges, and soft, delicious pastels. Forms range from compact spheres of ball and pom pon dahlias to the shaggy swirls of informal decorative and cactus dahlias to elegant singles like peony and collarette dahlias. And sizes range button-sized pom pons to dinner-plate dahlias ten inches or more across. Whatever your preferences, you'll find gorgeous dahlias at the Farm's booth in the market. 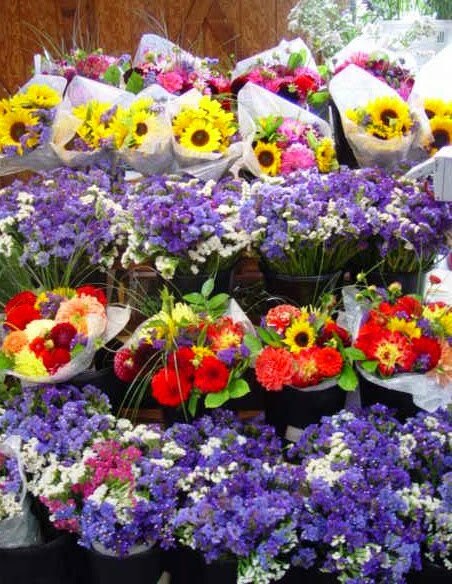 And if there's a wedding in your family this summer, you'll be able to choose the types and colors you'd like for your wedding bouquets and decorations; you can order flowers while you're market-shopping. What could be more convenient?